The display is a collaboration between our project, the Fitzwilliam and the British Museum, and I am extremely grateful to Anastasia Christophilopoulou at the Fitzwilliam and Thomas Kiely at the British Museum for all their help, ideas and hard work in getting it all together. Yesterday was installation day, and it was a real privilege for us to be allowed to go behind the scenes and witness what happens when a display is being set up. I had no idea what a painstaking process it is, and came away with a real admiration for the museum staff who deal with these things all the time. Some items in the display are loans from the British Museum, which meant that they had to be condition-checked carefully before they could go on display. The same process was necessary for our replica tablets too, which technically are on loan from the CREWS project to the museum for the period of the display, while other items are from the Fitzwilliam’s own collection. My favourite part of the condition-checking was the very large and effective lamp that was used. It showed up finely-incised text on stone beautifully. If you look at the picture above and spot the presence of two different writing systems, you are not wrong – this is the Idalion bilingual, the inscription that was instrumental in the decipherment of the Cypriot syllabic script. We’ll talk about it more soon, but it was a great opportunity for us to look very closely at the inscription and see which signs were clear and which were more eroded, and also to think about how it was incised. In the background of this and some of the other photos you can see the large cases of the Cypriot gallery where the display is housed, packed with a host of other wonderful objects (including a few more with inscriptions). After all the checking, it was time to begin positioning the objects. If that sounds straightforward… it really isn’t. For one thing, a lot of preparation has already gone on behind the scenes, thinking about how to lay out the objects and what to say about them in their labels. The idea behind the display is to tell the story – or rather stories – of writing in the ancient eastern Mediterranean. But the amount of information that can usefully be displayed alongside the objects is necessarily limited, and that means that some planning is necessary. Each item then has to be fixed securely in place, and because of the different sizes and shapes of the objects, each one requires a different solution. Most of the smaller objects required some sort of pinning as they are displayed on a slope to make them easier to see. Try to imagine how to you would go about fixing a little (about 2cm diameter) spherical clay ball onto a sloping surface with supports that do not block the view while showing the inscription around the middle at its best, and you will have a good idea of the sorts of problems museum staff face! There are fourteen objects in the display, and aside from our two replicas, each one has survived thousands of years to arrive here today and play a role in our research. It was important to deal with each one in turn, so some objects lay in waiting for quite a while, like the Egyptian coffin fragment above, still in its storage box when the photo was taken. I’d be lying if I said it wasn’t a thrill to get up close to these treasures – and it’s a joy to be able to pass on our enthusiasm for ancient inscriptions by making a display that the public can visit too. If this post has made you keen to hear more, please do see if you can visit the display and/or keep an eye on this blog and our Twitter feed. We’re going to be blogging about each of the objects one-by-one, so even if coming to Cambridge isn’t possible for you, you’ll have a chance to see them up close and hear about why we’re interested in them. On Twitter we’ll use the hashtag #crewsdisplay so that you can easily find a list of tweets and blog post links. In the meantime, if you visit the display, or if think of anything you’d like us to write about in our blog posts, or if you have any other comments, please let us know! We would like to thank everyone involved in the installation of the display yesterday, from the Fitzwilliam and the British Museum , not only for all their hard work but also for allowing us to take part and to take photographs of all the activities. Here is a map of the ground floor of the Fitzwilliam Museum, to help visitors find the CREWS display – the big red X marks the spot! The display is in a case with a red background (+ one extra small case) within the Cypriot gallery, marked here as room 22. 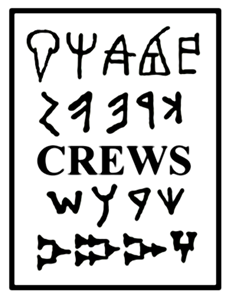 Pingback: Come and see the CREWS display!